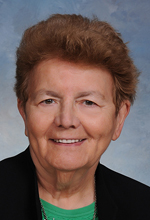 Sister Ursula Tisdall, O.S.F., died Dec. 13 in Assisi House, Aston. She was 85 and had been a professed member of the Sisters of St. Francis of Philadelphia for 66 years. Elizabeth Tisdall was born in Dublin, Ireland, where she was a member of St. Mary Parish. She entered the congregation in 1949 and professed her first vows in 1952. Sister Ursula earned a B.S. in history from St. Mary University in Emmitsburg, Md. and an M.A. in educational administration from Loyola University in Baltimore. She ministered primarily in education and in pastoral care. Sister Ursula ministered for 22 years in the Archdiocese of Boston, serving as a hospital chaplain and volunteering at Blessed John XXIII Seminary, as well as parish ministry in the Diocese of Worcester. Her 22 years of service in the Diocese of Wilmington included teaching at St. Anthony of Padua School and Holy Angels School in Newark. She served as principal of Immaculate Conception School in Elkton and St. John the Beloved School in Wilmington. She also served in the archdioceses of Washington and Baltimore, and the dioceses of Raleigh and Charleston (S.C.). The funeral Mass was celebrated Dec. 18 at Assisi House. Burial was in Our Lady of Angels Cemetery in Aston. Sister Ursula is survived by three sisters, Mary Horne, Ursula Corrigan, Sheila Connors; two brothers, James Tisdall and Noel Tisdall, nieces, nephews, and by her Franciscan family.